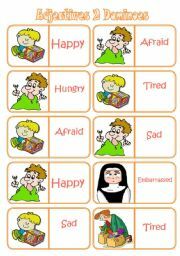 A set of dominoes to practice adjectives / feelings. The sets should be used separatedly, or it won´t work properly. Sets must have 28 pieces or so none will remain in the end of the game. Hope it´s useful. Thanks for downloading and have a nice day! 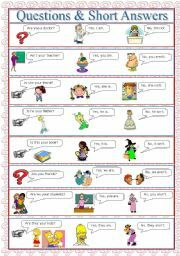 A simple guide on short answers with the verb to be to help my beginners understand the relationship between yes/no questions and answers. Hope it´s useful. 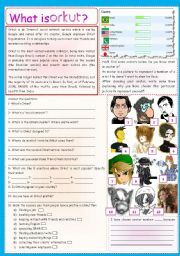 Some information about Orkut, reading and statistics comprehension questions. Students will answer and think about their personal characteristics, uses and risks of an Orkut profile, write a short testimonial about a friend and give their opinons about the site. Hope it´s useful. Thanks for downloading and have a nice day! Boardgame, cards and suggestions to play it in different ways according to your objective or your students’ level. The text is fully editable, so you’ll be able to adapt the questions if you like. 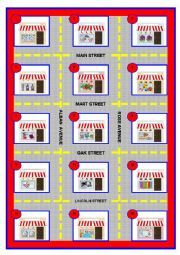 Find more worksheets and games at zaildacoirano.com. Thanks for downloading and have a nice day! Explanation and exercises to practice the Past Perfect. Hope it´s useful. 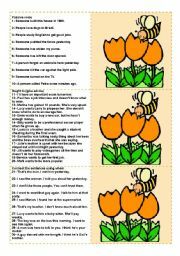 Jokes & pictures taken from the Readers´ Digest site (source given in the worksheet). 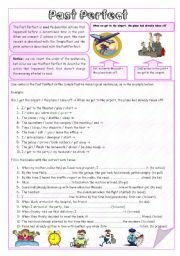 I prepared 2 pages with questions and exercises with the text, designed for intermediate students. It´s completely editable, you can erase, adapt or correct anything. Hope it´s useful. Thanks for downloading and have a nice day. 12 cards (9 pictures each) to practice 21 words on clothes & accessories vocabulary. The instructions, word cards and the list of words in alphabetical order are on the last page. It´s completely editable / correctable. Hope it´s useful. Thanks for downloading and "Merry Christmas"! 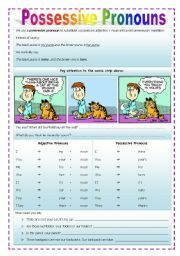 Explanation and some exercises about possessive pronouns.